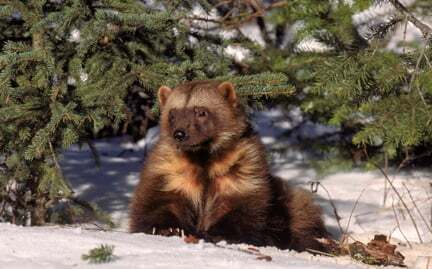 The largest land-dwelling member of the weasel family, wolverines live in isolated areas throughout much of the far-northern hemisphere—particularly Canada. An adult is approximately the size of a medium dog and resembles a small bear with a long tail. Hunters and carrion feeders, wolverines are extremely strong and aggressive for their relatively small size and have been known to attack considerably larger animals, such as moose trapped in snow banks. While tough and versatile, wolverines are still vulnerable to threats like habitat loss.